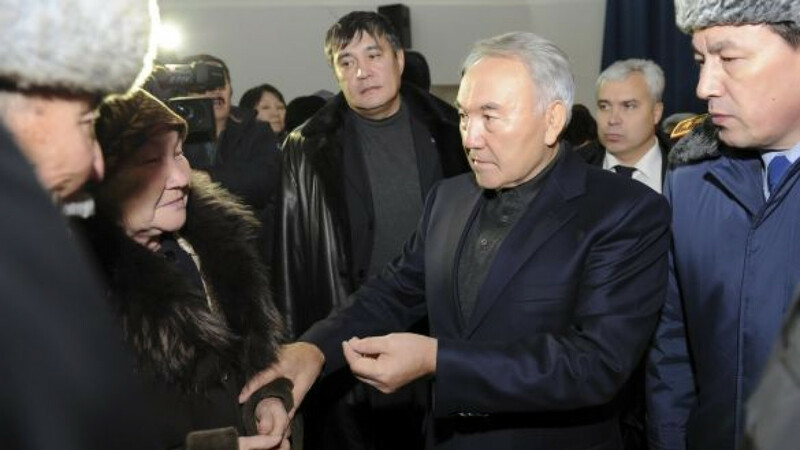 Nazarbayev speaking with locals Thursday in Zhanaozen, where oil worker firings had erupted in mass riots. ALMATY — Kazakhstan's leader has said he would fire his son-in-law from the top job at the sovereign wealth fund, accusing its oil and gas unit of mishandling a strike that erupted into deadly riots. President Nursultan Nazarbayev's surprise arrival in the western oil-producing region of Mangistau coincided with growing international pressure to investigate the violence on Dec. 16 and 17, which killed at least 16 people and wounded 110. State television showed a stern-looking Nazarbayev in the regional capital Aktau saying he had replaced the heads of state oil and gas firm KazMunaiGas and its London-listed subsidiary KazMunaiGas Exploration Production. He said the management of KazMunaiGas had failed to implement his order to resolve a labor dispute that has been simmering since thousands of oil workers downed tools in May. "The workers' demands were in general justified," he told a gathering of local officials and members of the public in Aktau. "The employer should not have forgotten that these are our citizens. They have not fallen from the moon. "They should have listened to them and, as much as it is possible, supported them. To my regret, this was not done." The axe now appears likely to fall on Timur Kulibayev, who is married to Nazarbayev's middle daughter, Dinara. Billionaire Kulibayev, one of the country's most influential people, runs the sovereign wealth fund Samruk-Kazyna, which owns KazMunaiGas. "I will take the decision to dismiss the head of Samruk-Kazyna, Timur Kulibayev," Nazarbayev said Thursday. Though the dismissal has not been formally announced, any fall from grace could see Kulibayev sidelined as a potential candidate to succeed his 71-year-old father-in-law as president. The question of who will succeed Nazarbayev, the only man to have led independent Kazakhstan in its 20 years of independence, is cited as the single biggest risk to stability by foreign investors who have put more than $120 billion into the country. A shrewd businessman who rarely speaks in public, Kulibayev is ranked Kazakhstan's third-richest man by Forbes magazine, with a fortune of $1.3 billion. He has played down the idea of political ambitions, saying he is more concerned with business. He is also chairman of the board of KazMunaiGas and a board member at Russian gas export monopoly Gazprom. In a major reshuffle of oil sector management, Nazarbayev replaced the chief executive of KazMunaiGas — Bolat Akchulakov, a Kulibayev appointee in the job for less than three months — and installed Deputy Oil and Gas Minister Lyazzat Kiinov. KazMunaiGas EP also said its chief executive, Askar Balzhanov, had resigned and been replaced by Alik Aidarbayev, managing director of KazMunaiGas and board chairman at KMG EP. The violence in Mangistau was centered on the town of Zhanaozen, 150 kilometers inland from the Caspian Sea, where oil workers and supporters have been protesting for seven months after being sacked by KazMunaiGas Exploration Production. People in overalls bearing oil company logos were among those on the main square when protesters and riot police clashed on Dec. 16, Independence Day. Police fired shots, and buildings were torched, including the local oil company headquarters. "The employer decided to sack company workers illegally, including those who had not shown up for work for valid reasons," Nazarbayev said. He added that 1,800 sacked workers must be given new jobs quickly, and fired Mangistau's governor. "One should never forget that stability is the main prerequisite of Kazakhstan's success," he said. Witnesses have said more people might have died than the official death toll of 16. The United States and the European Union have expressed concerns about the violence and urged Kazakhstan to conduct a transparent investigation. The authorities say police were forced to open fire after being attacked by "criminal elements" and "hooligans" who were threatening civilians. A 20-day curfew is in force in Zhanaozen. "Persons who have nothing to do with this work dispute took advantage of the complicated situation and organized mass disorder," Nazarbayev said. A resident of Aktau said by telephone that the square in front of the local government headquarters, occupied for days by sacked oil workers and riot police, was empty of protesters on Thursday for the first time since the weekend. Kazakh officials said the country had invited United Nations experts to participate in an investigation of the violence. The authorities have so far defended the actions of the police. "When demonstrators go beyond their right of peaceful protest and start attacking onlookers, the police, the government has no choice but to react and to protect public safety," Yerik Utembayev, head of Kazakhstan's missions to the European Union and NATO, told reporters in Brussels. New York-based Human Rights Watch urged the authorities to investigate immediately allegations of torture and ill-treatment of detainees following the violence in Zhanaozen and to hold those responsible accountable. It condemned the death of a 50-year-old man in Zhanaozen from injuries it said were sustained in police custody. An amateur video, apparently taken on a mobile phone from an apartment window on Dec. 16, was posted on the Internet on Tuesday showing police shooting at fleeing protesters. The clip's authenticity could not be verified independently. Radio Liberty reported that Erlan Idrisov, Kazakhstan's ambassador to the United States, told a news conference in Washington on Wednesday that the Kazakh government was aware of the coverage and planned to investigate it.